With the start of the month comes the standard My Nintendo updates, and now the North American equivalent is on board. Capitalising on the buzz of upcoming footage of The Legend of Zelda: Breath of the Wild, the rewards are mostly focused around the iconic franchise. Details are below; as you can see there's a mix of HOME Themes, game discounts and even some downloadable videos. Also of note is Flipnote Studio 3D, which is available as another Platinum Point extra. Are any of you North American gamers tempted by these new rewards? I'm going to grab the home theme for sure, and maybe skyward sword. Finally, stuff to spend coins on that aren't only discounts. Here in Europe we'd love for these! @Fenrir6 We already got Flipnote Studio 3D - as a signup bonus back when the service first launched. The theme would be nice tho'. Wait, arnt those videos the same ones they put up on Nintendo Video to advertise the concerts? Spent your coins on retro adverts kids! We might also have an old Super Mario Kart ad in the office somewhere to add too! @buildz I was talking about the theme and the videos. That's a nice Zelda theme right there! I wonder what the music on it is? But sometimes I don't get you Nintendo. You just released Swapdoodle a week or two ago and now you're bringing back Flipnotes for a third time? At least 50% would get me to buy Skyward Sword again, but why such measly discounts? There should also be a freebie option for 230 gold coins. I got the theme and videos. Of course I would like to spend my 2000 points on a GAME but whatever. @ReshiramZekrom Apparently, ol' Tommy really loves his Link to the Past. Hopefully these aren't the Eshop sales that the Game Awards guy said are coming during the show. Got the theme and since my Black Friday Mario New 3DS just came in, I got ALttP. I'm pretty annoyed that Nintendo doesn't give me a discount for having it on Wii U, but this was just good enough to get me on board. I have fond memories of playing ALttP on my GBA SP on the go that I can now relive. Like others have said, I'm glad there is finally something neat to spend my coins on. 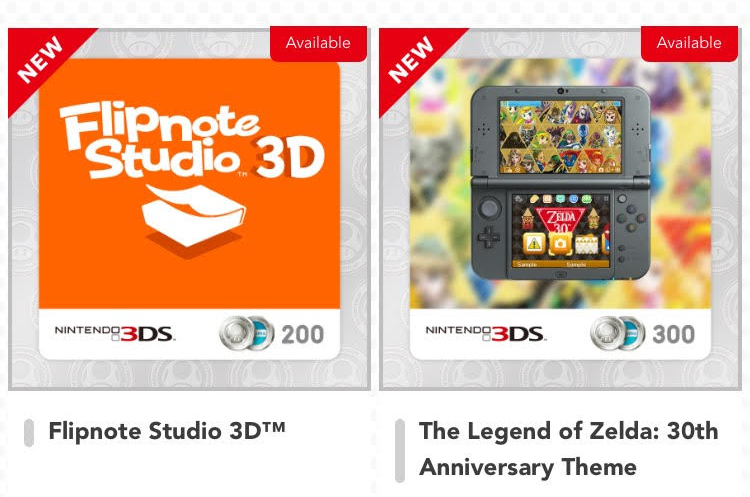 I'll either grab the Zelda theme or the Flip Note download. Silly me, thinking that DSiWare Four Swords would show up. Of COURSE Flipnote 3D says "Zelda 30" better than that game! @Angelic_Lapras_King the videos are fine, the music is good. They do mention they were available on Nintendo video, but that was five years ago.... And these are permanent downloads instead of a failed video service. Just downloaded the 30th Anniversary theme. Worth it for the heavenly music alone. I don't have Link to the Past on my New 3DS yet, so I'll be scooping up that discount. The other Zelda-related goodies seem pretty cool too. Anyone downloaded the 3 orchestral videos are they good ? @hieveryone the music is from the CD that came with Skyward Sword during the 25th anniversary. Its really good. The videos show the performers, and they are in 3d. Look these are really good, but can we get some games please? The discounts are nice though I can't use em. The videos are cool, I didn't have them already. The theme is glorificent. Looks good and has good music. The theme is nice, but I'm mostly happy that My Nintendo is offering 3D videos as rewards. Maybe we'll see the Kid Icarus 3D Anime and Kirby: Right Back At Ya! videos added as rewards in the future. Well, one can dream. I'll grab the theme for sure. Better than a lemon hat for Miitomo. Still sick of these discounts though. What happened to those VC games? That Zelda theme is really nice. Got the theme and Main Theme Medley. Yeah, they're good. I like that BOTW Link and Guardian are there. @allav866 Japan has the Kid Icarus anime. The Zelda 30th Anniversary theme is amazing. Probably my favorite My Nintendo reward that I've gotten. If they're adding 3D videos, add the 3D Kid Icarus anime shorts! I would redeem coins or buy those!! Wait- a MyNintendo 3DS theme that doesn't have that awful music track? And Zelda to boot? Count me in! I'd gladly spend my Platinum coins on a couple of Super Mario Kart ads. Better than half the stuff available now anyways. Want to pick up Link to the Past as well- just have to decide which one to get- probably WiiU. Too bad there's no crossbuy. I don't suppose the $2 for already owning one applies either? I am guessing no. @YouSeemFRAZZLED I know, which makes me want it to come to the American My Nintendo website even more. I bought the theme and a video. By the way, does anyone know what happened with that My Nintendo holiday sweepstakes? I grabbed the 30th Anniversary theme (wow is it beautiful!) and finally remembered to also redeem the Samus theme. My Nintendo could still be legions better, but it's hard for me to complain about the free stuff. This is still nothing. GIVE IS SOMETHING MORE! Why make their sites unable to be viewed on their console's browsers? That makes NO sense! Assuming the entire continent is obsessed with Zelda... hey Nintendo, you're WRONG! @OdnetninAges If you own a 3DS. I'm a Wii U only owner. 500 points expired on me. @Beau_Skunk Completely agree. It's stupid isn't it? They can't even run their own site on their own hardware. The logic of Nintendo at times is dumbfounding. @ThomasBW84 - You've got Link to the Past listed as Wii U twice. One is for 3DS. Ok, just downloaded the theme and 3 videos. Maybe they should put better offers in games. Home theme is totally worth it. Nice for the platinum, but what about the gold coins? I still have 65 gold coins and I don't have anything to get for my 3DS. Getting the home theme and LttP on N3DS. I've been waiting for a sale for that game for a while as the base price is pricey in Canada. I'll get that in a few weeks. I will also get one of the videos. I was glad to finally have something to spend the coins on. The theme and the videos may not be much, but they are better than any of the other offers. Definitely getting the Zelda theme and videos when they come to Europe. I guess I'll grab the theme. Lots of stuff you probably aleady own otherwise. The 30th anniversary theme looks cool so I will probably spend some points on it. they have discounts on games I already have - and I still think those are a rip-off. WTHeckbeans Nintendo - those discount rewards are no good. For 240 points - it should be 75% off. Is a Zelda an NA-only franchise now?